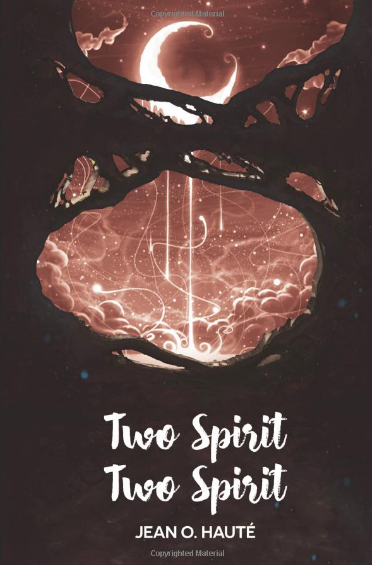 Two Spirit Two Spirit is a short work of poetry written by Jean O. Hauté, a writer who has kept much of his persona under the radar in regards to this book. After speaking to him personally and reading the book myself, I can understand why. As this is a fairly short book, it will be a fairly short review as well. Now, I am no expert in poetry. Much that makes up the form and detail escapes me. However, I am familiar with how words and emotions can work together to paint imagery. And this is something that Two Spirit Two Spirit excels in. The inspiration behind his work is something that the author keeps close to himself but is not hard to understand the situations that may have born such words while reading them. Constantly throughout the short work, I found myself understanding the people that were being described. I felt that I had met them, and had at least a general idea of the situations in their lives that had helped to shape them. One thing that struck me as unique with this work was the difference in perspective that I see in normal poetry. While my normal reaction to poetry is to get sucked into the mind of the author, instead I find myself almost on a journey to hear the story that inspired these works. This is something that I haven’t found in other similar works and speaks volumes about the time that must have been put in to craft it (this was the third edition I suppose). With that said, there were some things I feel could have been fixed. Especially on the third edition of the book. The language is, while descriptive, bland. It detracts slightly from the overall work when the word choice is what I can only describe as plain. In addition, the subject choice seems to be similar from piece to piece. There was very little change in topic. Now, this is a simple matter, the works in the book are reflective of the author’s life and experiences. But the lack of diversity in topics also detracts from the overall work. I’m again, no expert in poetry. And I recognize that the work is very subjective depending on the reader and the author. As such, ranking Two Spirit Two Spirit on a scale from 1-10 would be almost insulting to the genre. So instead I’ll say this. I will definitely recommend the work to anyone who enjoys the poetry of a darker nature. It is likely to take you back to anyone you may have known in similar situations and give you a fonder regard for the frailty of the people in our lives. I enjoyed it, and I think you will as well. A quick and short read, definitely worth picking up.